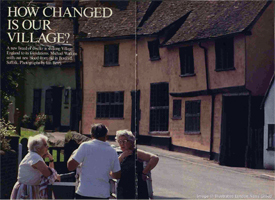 "We haven't got a lot to moan about in Boxford," says one lifelong resident, and looking around this attractive and lively village it is not that hard to see what he means. Numerous shops and businesses continue to thrive here, and the streets lined with picturesque buildings, are not empty silent in the almost sepulchral way you find in other comparable villages, but filled with the bustle of people going about their business. A glance at the Boxford Newsletter, distributed free by the Boxford Community Council, gives some idea of the number of activities and events that take place in the village each week. In recent weeks there has been a coffee morning in aid of Amnesty International, a Crazy Race night organised by the Boxford Bowls Club, a concert by Hadleigh Choral Society held in the parish church, a Call My Bluff evening, and a music hall evening. The graveyard of Boxford church is well planted with mute inglorious Miltons, their dust restored to this corner of England that bore them. They were not innovators; neither was it in them to challenge the order of things. They were born to do as they were told, each knowing his place; they were reared to duty. When they were called to arms, they went. They shed their youth and their blood, some of them, in foreign fields; and if at the going down of the sun and in the morning, we remember them, they would expect no more. Boxford never stole the limelight. John Winthrop, from the adjoining parish of Groton, convinced that "evil times are come when the Church must fly to the wilderness" set sail in 1630 to found Boston and become first governor of Massachusetts. At nearby Polstead in 1828 wicked Squire William Corder murdered Maria Marten in the Red Barn; a foul deed which addicts of village hall melodramatics will never let us forget. Boxford's chief claim to fame, or infamy, is that Corder faced the magistrates in a panelled room at The Fleece Hotel before being hanged in front of 10,000 people at Bury St. Edmunds. 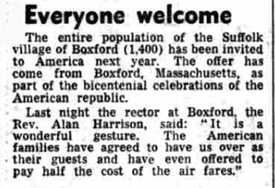 The entire population of the Suffolk village of Boxford (1,400) has been invited to America next year. The offer has come from Boxford, Massachusetts, as part of the bicentennial celebrations of the American republic. Last night the rector at Boxford, the Rev. Alan Harrison, said: "It is a wonderful gesture. The American families have agreed to have us over as their guests and have even offered to pay half the cost of the air fares." Boxford is one of the beautiful villages of Suffolk. Yet at times it looks just slovenly. Lying snugly and compact about its 15th Century church in the valley of the Box, it has domestic buildings of sufficient beauty to elicit from Norman Scarfe the description 'perfect village'. It also has dome fine properties that are shabby and neglected, some of them by absentee landlords. If the fluttering papers and wrappings and the tin cans thrown into the river Box are anything to go by there's a sad lack of local pride. Yet walk through this village one is aware not only of its unassuming sense of history but also of the warmth and friendliness of its people. It is something so real you can feel it. There is nowhere I would rather live. I like to walk along the road from Sudbury high above the village. The land dips and rises falls away in great fields that in the spring and early summer are green with barley. This undulating landscape with views to Edwardstone and Groton is characteristic of this part of Suffolk. Last year an attempt was made to form a centre at Boxford of the Cambridge University Board of Extra Mural Studies and a series of lectures was started, but later had to be abandoned owing to lack of support. 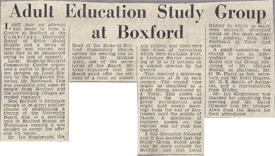 Later, Stoke-by-Nayland Community Centre organised a course at Boxford often lectures on Local History by the well-known Historian, Mr. Northeast. 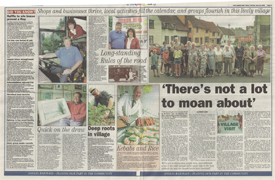 This was successful and some 40 people from Boxford and the surrounding villages attended regularly. Now Boxford is fortunate enough to be given another chance of establishing a Centre of the University Board, an at a meeting held in Boxford School on Wednesday evening it was decided to accept the offer and try again. 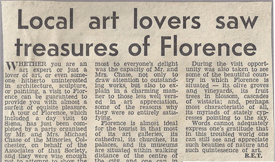 Whether you are an art expert or just a lover of art, or even someone hitherto uninterested in architecture, sculpture, or painting, a visit to Florence can be guaranteed to provide you with almost a surfeit of exquisite pleasure. A tour of Florence, which included a day visit to Siena, has just been completed by a party organised by Mr. and Mrs. Michael Chase of the MInories, Colchester, on behalf of the Associates of that Society, and they were wise enough not to attempt to show the party too many of the treasures of this remarkable city, but gave ample time to enjoy some of what are acknowledged to be the greatest artistic masterpieces ever produced. The winners in last week's draw, organised by the Community Council, were as follows: No. 752 Robert Simpson, 19 Homefield; No. 597 C. E. King, Sudbury; No. 637 H. Glover, Cox Hill; No. 976, Mrs. M. Williams, Edwardstone; and No. 989 J. E. Griggs, Edwardstone. The winners in this week's draw, organised by the Community Council, were as follows: No. 778, Mrs. G. Jones, Parsonage Farm; No. 562, Miss L. Tricker, Homefield; No. 619, Mr. D. Grimwood, Calais Street; No. 636, Mr. E. Heat, Cox Hill; and No. 543, B. Fearis, Ash Street. 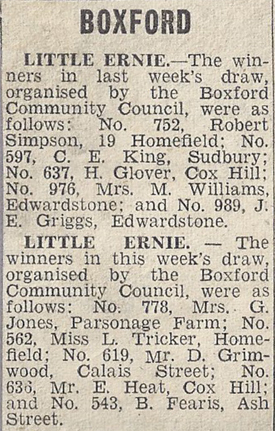 Great interest is shown in Boxford in the formation of a branch of the Ramblers’ Association in Sudbury. 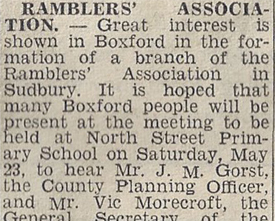 It is hoped that many Boxford people will be present at the meeting to be held at North Street Primary School on Saturday, May 23, to hear Mr. J. M. Gorst, the County Planning Officer, and Mr. Vic Morecroft, the General Secretary of the Southern Area of the Ramblers’ Association. The announcement that the Mayor Elect of Sudbury, Miss Muriel Head is to be in the chair has also been received with satisfaction. A good deal of preparatory work as already been done in the Boxford area, and it is most encouraging to find that local landowners are most kind and co-operative. That there is a future for such a branch in this district is quite obvious. 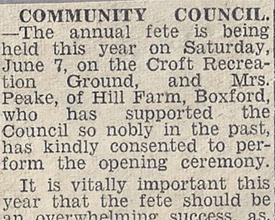 The annual fete is being held this year on Saturday, June 7, on the Croft Recreation Ground, and Mrs. Peake, of Hill Farm, Boxford, who has supported the Council so nobly in the past, has kindly consented to perform the opening ceremony. It is vitally important this year that the fete should be an overwhelming success, as with the cost of the Pavilion looming up, it is essential that the Council raises sufficient money to pay its share. There will be the usual attractions and the presence of the Long Melford Silver Band will in itself be enough to ensure a pleasant afternoon, provided the weather is reasonably kind. The Boxford, Groton and Edwardstone branch of the British Legion entertained members of E. Group at their meeting at the Fleece Hotel, Boxford, on Thursday last. Mr. D. W. Ellis was in the chair and Mr. Jerrold, the president, was also present. Various matters of general interest were discussed and it was agreed that in future regular meetings of the Group would be restricted to two per annum and that there should be two social evenings during the year to which a guest speaker would be invited, at which members could meet each other under somewhat more carefree conditions. Chairman of the West Suffolk County Council, Brig. 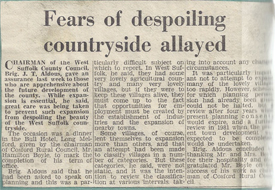 J. T. Aldous, gave an assurance last week to those who are apprehensive about the future development of the county. While expansion is essential, he said, great care was being taken to prevent such expansion from despoiling the beauty of the West Suffolk countryside. The occasion was a dinner in the Bull Hotel, Long Melford, given by the chairman of Cosford Rural Council, Mr. Hamilton Boyle, to mark the completion of his term of office. Brig. Alders said that he had been asked to speak on planning and this was a particularly difficult subject on which to report. 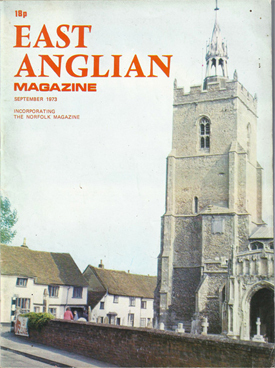 In West Suffolk, he said, they had some very lovely agricultural country and many very lovely villages, but if they were to keep these villages alive, they must come up to the fact that opportunities for employment must be created by the establishment of industries and the expansion of nearby towns. 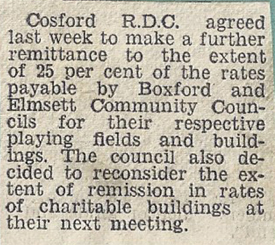 Cosford R.D.C agreed last week to make a further remittance to the extent of 25 per cent of the rates payable by Boxford and Elmsett Community Councils for their respective playing fields and buildings. The council also decided to reconsider the extent of remission in rates of charitable buildings at their next meeting. 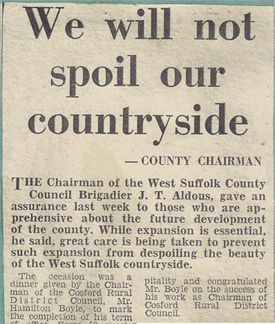 The Chairman of the West Suffolk County Council Brigadier J. T. Aldous, gave an assurance last week to those who are apprehensive about the future development of the county. While expansion is essential, he said, great care is being taken to prevent such expansion from despoiling the beauty of the West Suffolk countryside. A highly successful social evening was organised by the Boxford branch of the British Legion on Saturday evening. As always, the brunt of the work was borne by members of the Women's Section, who produced their usual smooth-running programme and tasty food in plenty. 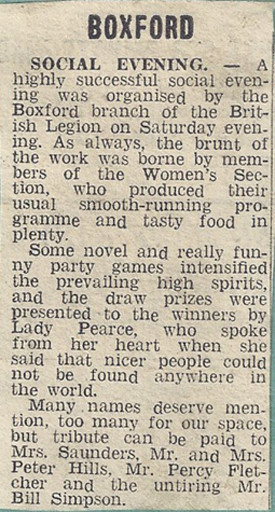 Some novel and really funny party games intensified the prevailing high spirits, and the draw prizes were presented to the winners by Lady Pearce, who spoke from her heart when she said that nicer people could not be found anywhere in the world. Many names deserve mention, too many for our space, but tribute can be paid to Mrs. Saunders, Mr. and Mrs. Peter Hills, Mr. Percy Fletcher and the untiring Mr. Bill Simpson. 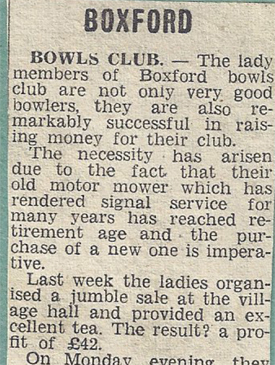 The lady members of Boxford bowls club are not only very good bowlers, they are also remarkably successful in raising money for their club. The necessity has arisen due to the fact that their old motor mower which has rendered signal service for many years has reached retirement age and the purchase of a new one is imperative. Last week the ladies organised a jumble sale at the village hall and provided an excellent tea. The result? a profit of £42.